First, if you’ve enjoyed seeing George Galloway bite anyone’s head off in the past, then you’ve got to see him devour a bimbo newscaster for Murdoch’s Sky News here. I spent Sunday riding bikes with a couple of filmmaking friends, Bill and Sarolta. We went through Bayview/Hunters’ Point to see the Candlestick “Stonehenge” and had a lovely visit, too, to the gorgeous median gardens on Quesada. 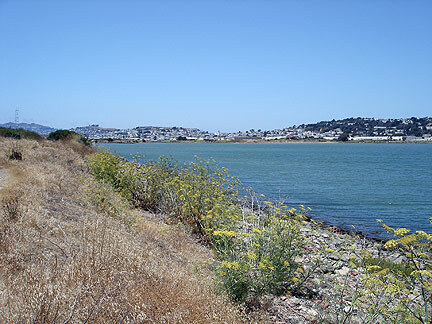 The northwest view from the northern tip of Candlestick Recreation Area, over the Yosemite Creek cove, slated to be a new gentrified waterfront in some planners’ fantasies! Later we rode north to India Basin open space, around the closed power plant and through a part of Heron’s Head park. If you’ve got a fondness for abandoned industrial landscapes at the turning point, just before they start to become ‘revitalized’ urban waterfronts full of new condo owners and green lawns and manicured shoreline parks, get yerself down to the southern bayshore in the next few months. Big plans are afoot and you can smell it in the air. 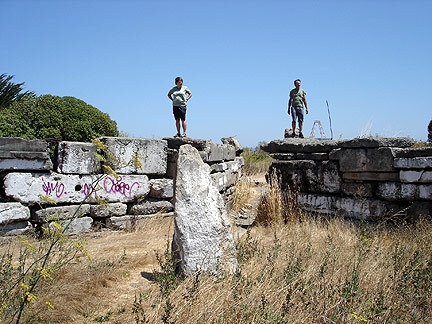 Redevelopment and the demise of Bayview as a black neighborhood are on the agenda, though may still be stopped by the urgent efforts of the SF Bayview newspaper and its allies. 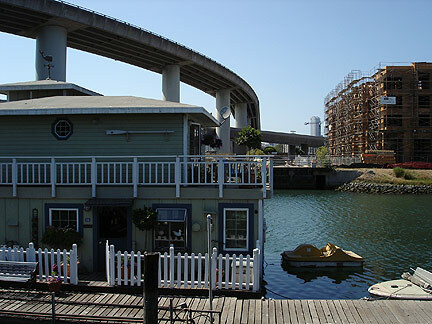 For a taste of the planned but still not certain future, ride north towards the Giants ballpark and turn west at Mission Creek to enter the weirdly suburban Mission Creek park, facing a wall of new condos on the north side of the creek, radically altering the once charming isolation of the remaining houseboat community down there. 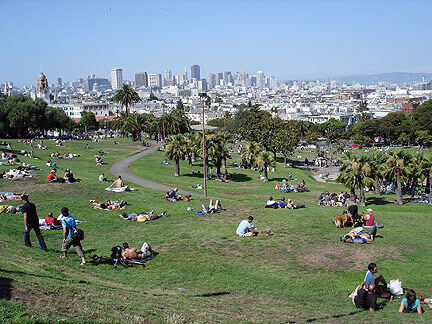 Anyway, riding and talking and hopping around in the cityscape, talking to people at gardens and various spots along the way, was truly to inhabit this city on a beautiful day, fully interacting with the densely layered experience of San Francisco. Near the end of Sunday’s journey I passed my old haunt on 19th Street near Guerrero, where the long-forgotten Christopher Dairy facade has been torn down to make way for a huge condominium development. 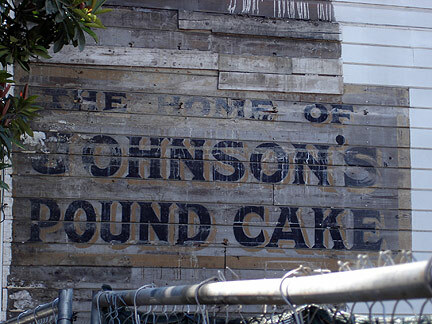 But a temporarily visible treasure is this sign… what did Johnson’s Pound Cake taste like? Did they sell it in the store that is now replaced by a garage on the ground floor? Mysteries in plain view are one of any city’s charms if you’re willing to walk or bike around and find them. By contrast, a two-day “summit” is underway at the Swedish-American Hall on Market Street on the “Interactive City“… I’m sure there are some very interesting and well-meaning people there, but I found the first 6 hours of this shindig an embarrassment. First of all, isn’t it redundant to say “interactive city”? What is a city but an infinitude of daily interactions among its inhabitants and between humans, pets, wild animals, and the environment? What these folks seem to mean, taking into account that it’s sponsored by Intel, is that annoying idea of “Interactivity” that involves individuals relating to technological devices like computers and cell phones and giant electronic billboards. Of course they sometimes talk to each other, and for a couple of decades now, the idea of interactivity has only been meaningful when it refers to technologically mediated experiences. The everyday interactivity that involves the infinitely complex variations among living, breathing humans is somehow not included in this reified category. The Summit started very late with a ridiculous ‘trial run’ of the so-called ‘voting system’ which was going to demonstrate ‘interactivity’ in its ability to compile everyone’s opinions graphically, and allow the hosts to phone various respondents to get them to offer a comment. This was the perfect demonstration of the stilted and useless practice of technological interactivity. First we were supposed to call a phone number from our cell phones (“keep them on please!”) and then press either 4 or 6 if we were a morning person or an evening person. Later, presenters were coached to ask questions with simple binary responses too, but it didn’t work at all as the speakers couldn’t boil down their more complex concepts into such banal Q&A’s… At lunch there were breakouts that encouraged everyone in attendance to formulate questions about interactivity and then comment on each other’s ideas… This led after lunch to a very long report back process from the two breakouts, and actually quite a lot of discussion and questions among all in attendance, breaking completely with the foolish effort to run the dialogue through cell phones. But I had to go anyway. I met a few people who were having similar issues to mine, having to do with class, economics, power, framing, etc., and they tried to get those into the discussion with some limited success. David Cox threw the Situationists into it early on (he’s got an interesting “Archifesto“) which got a condescending thanks from the Intel guy at the break. But the Intel guy who convened the Summit was determined to flatten all the discussions out and kept talking about how to ‘leverage’ various ideas and practices, presumably towards some kind of marketability… even if he wasn’t so narrow as to close off interesting threads, ultimately he was gathering all the phone responses and whatever else his team could get for Intel’s “urban atmospheres” project. Clearly their mission is to figure out how to colonize this self-described cohort of cutting edge technology designers, at least how to join their corporate project with the flow of ostensibly independent interactive summiteers’ thoughts… yeesh. Gave me the willies! About 13 years ago I wrote an article in which I argued that interactivity is to entertainment as self-management is to work. You are supposed to give over more of your brain to an empty process over which you have no real say. It’s a way of intensifying how much of your own energy goes in to an activity, which of course makes it feel more intense if you go along, but it doesn’t address the fact that what you’re participating in is ultimately pointless at best. Real interactivity is something that goes on among humans. Though some technologies can facilitate and enhance that sometimes, it’s a frustratingly common delusion to imagine that interactivity is defined by or made possible by devices. Similarly, a constant invocation of the need for more “participation” was challenged by several summiteers, but it didn’t look like there was much room for a real revolt of this mostly docile fraction of the cognitariat.